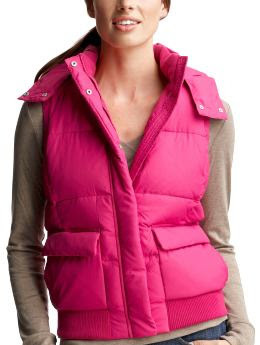 The Gap has this great Puffer Vest for only $59.50. It comes in black, off white, brown, navy, or my favorite one...fushia! It has pockets and a detachable hood as well. If you want to splurge a bit more, JCrew has this Sherpa Puffer Vest for $118. It comes in brown, sage, grey, navy, ivory, and peach. The reasons why I really like this vest (even though it's more expensive) are that it's goosedown filled so it's really warm, it's also lined with fleece which makes it warmer and comfy, and lastly because it hits low at the hip. This vest does not have a hood. 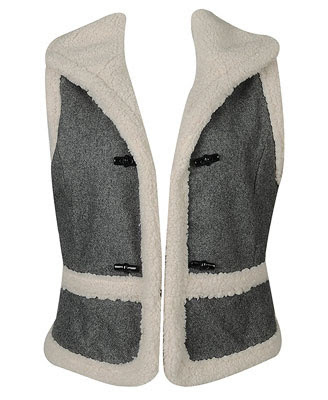 For something a little different, but still cute, Forever 21 has this Toggle Fleece Vest for $27.80. It only comes in this dary grey and cream color, but it's lined with fleece so it's comfortable and will help keep you warm.